Today’s Draw: Hymir & Hrod/Five of Swords; Raido; Bergelmir/Six of Swords. 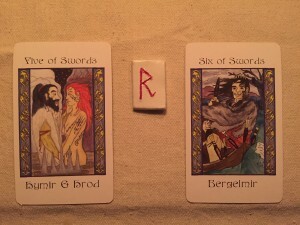 We have the same cards as Saturday’s reading, and yesterday’s rune. Sometimes, the oracles are quite subtle. This is not one of those times. Bergelmir rides out the flood from the safety of his boat. Raido takes you for a ride on a horse. Hymir and Hrod stand in the flood waters where Muspellheim and Niflheim meet. Where are you standing, and where do you need to go? How will you get there? Look at all that water. All that emotional energy bursting forth, requiring release and recognition. The airy intellect of the swords will help you channel it so you can use it to move forward and make changes, rather than being overwhelmed and drowning in the intensity. Your day may bring surprises varying between delight and distress. Remain calm, and use your brain to devise creative responses to the situations. You may not have a lot of time to plan, but take the time you have, and use it to make good decisions. Mind over matter, air over water. Find the balance you need to stay afloat.